This article describes how to replace the light bulb that lights up the Palantir translucent ball on Sterns Lord of the Rings pinball machine with a multicolor led. It is very easy to do, even someone with basic soldering skills can do it. The multicolor led is a type that will change in color out of itself when it gets power (so no extra driver board is needed to select the color). It was bought from the website www.world-led.com, and is the Multicolor 5MM RGB diffused type. Other stores like DealExteme.com probably have a similar led for sale. 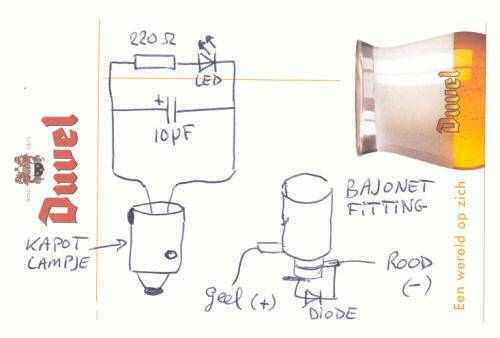 The whole assembly is soldered into the base of a broken light bulb. This is not necessary, but it has the advantage that this modification becomes just like a light bulb you plug in. No additional soldering is necessary to the machine wiring itself. If you want to undo this mod it's as simple as replacing a light bulb. On one of the legs of the led you connect the 220 ohm resistor, and across this you solder the capacitor. All components are polarised so make sure you connect the + side of the led and capacitor together. The yellow wire going to the socket base is +. The parts ready for assembly. Extra Shrinktubing is necessary. The capacitor is required so the led will be powered continuesly. The led expects filtered DC current, without the capacitor the led will only show red as it will always restart its color-cycle. On games that receive low wall voltage it may be necessary to replace the 10 microfarad cap with one of 22 microfarad. So if the led stays red, put in a larger capacitor. Here is the color-cyle in action (simple gif animation). Update: this idea has been commercialised by a lot of pinball vendors. 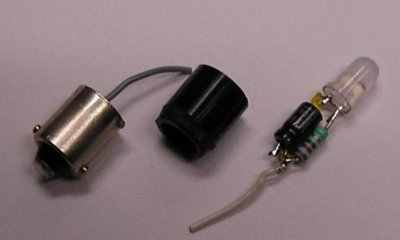 LED lamps for use in pinball machines are now available so you don't have to solder them yourself. Development of modification by Richard Baan. Parts photo by Glenn Verhoosele.